Mera Peak (altitude 6476 meters) , is one of the highest trekking peaks in Nepal lies on the edge of the famous Khumbu Region, where it overlooks many of the world’s highest peaks including Mount Everest, Kanchejunga, Makalu, Lhotse and Cho Oyu. Mera Peak (altitude 6476 meters) , is one of the highest trekking peaks in Nepal lies on the edge of the famous Khumbu Region, where it overlooks many of the world’s highest peaks including Mount Everest, Kanchejunga, Makalu, Lhotse and Cho Oyu. 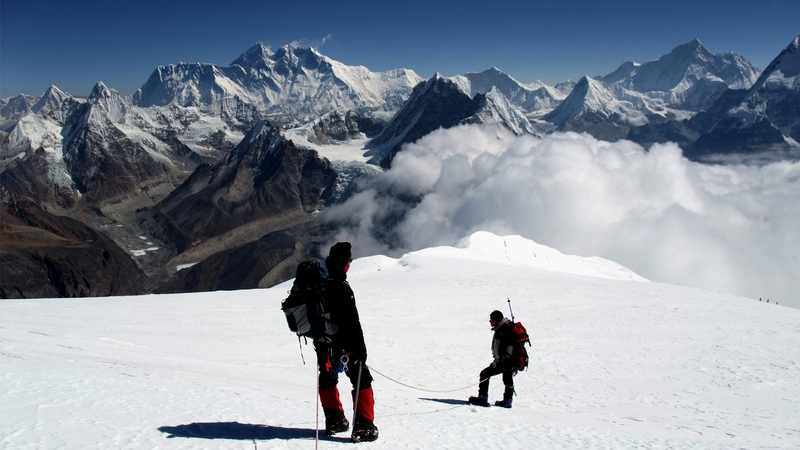 Although Mera Peak is very high trekking peak, the climbing is relatively not so much technical. Mera Peak is ideal for those with moderate mountaineering experience, a good level of fitness and a keen sense of adventure. The panoramic trip to Mera Peak keeps you lifting above the clouds, the mighty frieze of the world’s 8000 meter Mountains- Everest, Kanchenjunga, Makalu, Lhotse, Cho-Oyu and many other peaks. This exclusive trekking and climbing trips begins with a short and stunning flight to Lukla and continues through the high and lovely Hinku Valley. Although physically very demanding on account of the altitude, the climb on Mera Peak is not technically difficult as ascending snow slopes rarely exceed 40 degrees. Trekking Experts’ highly experienced and trained crew, unrivalled services, quality equipment and hygienic food ensure you that your Mera trip will be an lifetime adventure experience in Nepal.